B1 Preliminary also known as Preliminary English Test (PET) is an intermediate level qualification in English that opens the doors to opportunities for work, study and travel. read simple textbooks or magazine articles. write letters on familiar subjects. take notes in a lesson. understand the main points of straightforward instructions or public announcements. write letters or make notes on familiar matters. Preparing for B1 Preliminary gives these kinds of practical language skills. Choose when and how you take your exam - B1 Preliminary is available as either a paper-based or computer-based exam, allowing you even more choice over how you take your test. More than 3,000 employers, universities and colleges, government departments and other organisations around the world rely on B1 Preliminary. It is accepted wherever a high level of English language is required. What does B1 Preliminary involve? B1 Preliminary is an intermediate level assessment of English for people who want to use English for work and study situations. It consists of three papers: Reading & Writing, Listening and Speaking. The Speaking exam uses a face-to-face test with two candidates and two assessors. This creates a more realistic and reliable measure of your ability to use English to communicate. The B1 Preliminary Reading & Writing paper has five parts for reading and three parts for writing. There are different types of texts and questions. This paper accounts for 50% of the total mark. The B1 Preliminary Listening paper has four parts. For each part candidates have to listen to a recorded text or texts and answer some questions. Each recording is heard twice. Candidates will need to show that they can listen for gist (the main point), listen for specific information and recognise the attitudes and opinions of the speakers. They will hear individual people talking (monologues) and two people talking to each other (dialogues). This paper accounts for 25% of the total mark. The B1 Preliminary Speaking has four parts and will be conducted face-to-face with one or two other candidates. This makes your test more realistic and more reliable. There are two examiners. One examiner (the interlocutor) talks to you and the other examiner (the assessor) just listens. Both examiners decide your grade but the assessor gives more detailed marks than the interlocutor. The Speaking test accounts for 25% of the total mark. Try a paper-based sample B1 Preliminary exam paper. The exam is targeted at Level B1 of the CEFR. The examination also provides reliable assessment at the level above (Level B2) and the level below (Level A2). Scores between 120 and 139 are also reported for B1 Preliminary. 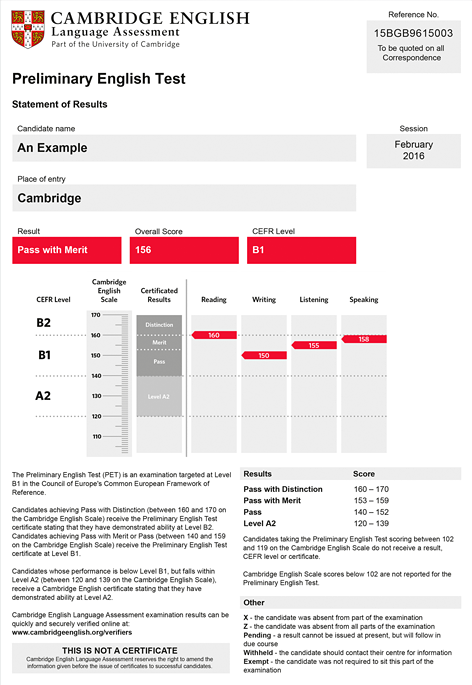 You will not receive a certificate, but your Cambridge English Scale score will be shown on your Statement of Results. 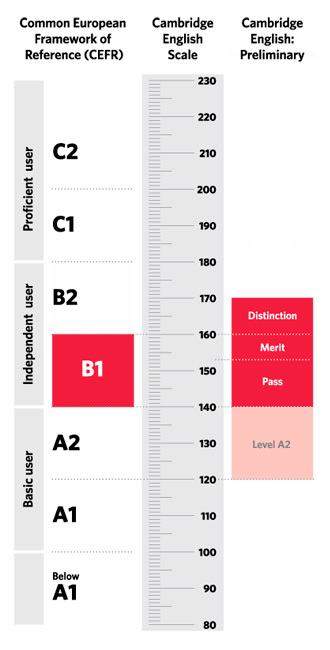 Please click on the image to the left of this text to find out the relationship between the CEFR levels, the Cambridge English Scale and the grades awarded in B1 Preliminary. Exceptional candidates sometimes show ability beyond B1 level. If you achieve a Pass with Distinction in your exam, you will receive the B1 Preliminary certificate stating that you demonstrated ability at Level B2. If you achieve a Pass with Merit or Pass in your exam, you will be awarded the B1 Preliminary certificate at Level B1. If your performance is below Level B1, but falls within Level A2, we will recognise your achievement with a Cambridge English certificate stating that you demonstrated ability at A2 level.